When Will I Get My Buckslips? 500 to 5,000 Buckslips: Ships or ready for pick up in 2 business days from proof approval. Under 500 Buckslips (printed digitally): Ships or ready for pick up in 1 business day from proof approval; UV coating requires 1 additional day. Over 5,000 Buckslips: Ships or ready for pick up in 5 business days from proof approval. When the situation calls for buckslips, you can trust 48HourPrint.com to complete your buckslip printing perfectly. We deliver high quality buckslip printing at very affordable prices — and more for your buck. Our online buckslip printing services also come with an industry-leading 48 Hour Turnaround Guarantee for quantities of 5,000 or fewer buckslips and our 24 Hour Turnaround Guarantee for quantities fewer than 500 buckslips printed on our digital press. 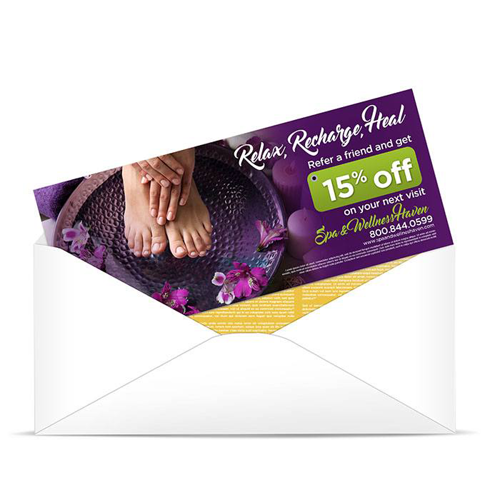 Buckslip printing is a perfect way to promote an offer or special deal in your regular mailing to customers. Include a timely offer or two in the same package as your monthly billing invoice, often without additional postage costs. Whether you want to stimulate renewals, promote a year-end sale, or introduce a new product, buckslip printing is the perfect medium.You can also partner with a company that provides complementary services, using buckslips to promote each other’s company. Buckslips are lightweight and an easy and effective way to reach your target audience. Preserving the environment is important to 48HourPrint.com. Recycled paper is our standard stock, at no extra cost to you. This delivers excellent buckslip printing results on paper that is brighter and more uniform in color. We offer both one-sided buckslip printing and two-sided buckslip printing in two sizes - 3.5” x 8.5” and 4” x 9” - printed on 100# text stock, with your choice of gloss coating, matte coating, or U.V. coating. For promotional tips on using buckslips, check out our buckslip marketing ideas. And review our buckslip templates for layout guidelines that will keep your print job on schedule.